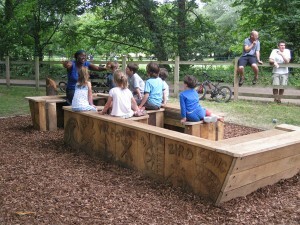 Today was the launch of the story boat at Morden Hall Park – and the end of the London Voices project with the National Trust. Sculptor Simon Kent carved the boat in panels of solid oak from Sherwood Forest, working to designs I produced using the drawings, prints and poems created by the families from Liberty School in Mitcham during the workshop sessions earlier in the year. 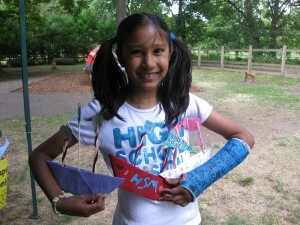 The launch was a great event, with over 250 people coming along throughout the day, and joining in with activities like making mini-boats (Suha, above, made three despite having a broken wrist! ), playing eels out and listening to exciting and adventurous tales on the boat with storyteller Diana. It was a great way to end a project that has been wonderful to work on from start to finish. The boat looked amazing and it was so exciting to see it finished for the first time. 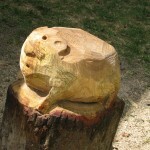 Simon also made five free-standing sculptures to act as bases for the game ‘Eels Out’ – below is the vole. We also presented the letterpress posters featuring the families’ poems that I made a few weeks ago with Ross and Jon from JMG Studio – each family and everyone involved was given one to keep as a special souvenir of the project. 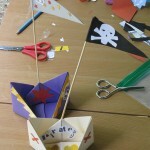 This entry was posted in General news, Workshops on July 5, 2009 by Jane Porter. What beautiful and inspiring website! Good luck for your Old Sweet Shop Show, your new work sparkles with humour and is very gorgeous and I’m sure it will be hugely admired.